After activist investors at Elliott Management and Bluescape Resources told the company to make some big changes, Sempra Energy responded. Whenever activist investors come knocking, management teams have to either somehow show what they are doing is right, or make some significant changes. 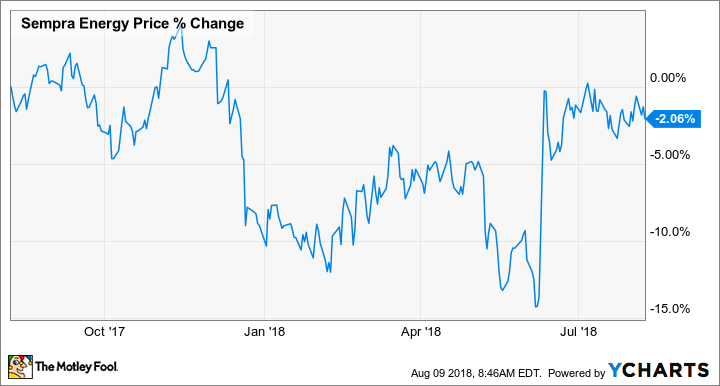 This past quarter, utility Sempra Energy (NYSE:SRE) did a little of both, to show activist investors Elliott Management and Bluescape Resources that it has a plan to unlock the value those investors claim it to have. As a result of these moves, though, Sempra had to make some considerable charges to the income statement. Here's a brief look at what happened at Sempra this past quarter, and at what management intends to do to appease its activist investors. DATA SOURCE: SEMPRA ENERGY EARNINGS RELEASE. EPS = EARNINGS PER SHARE. The big decline in earnings this past quarter had to do with $900 million in after-tax adjustments, related to the impairment of its non-utility natural gas storage asset and its wind power assets. Absent these charges, adjusted earnings for the quarter were $361 million, or $1.35 per share. These impairments both came in the company's infrastructure segment. One plus this past quarter was that we got to see the impact of the Oncor acquisition. All of the year-over-year gains for Sempra's utilities segment were from Oncor -- its other utilities posted year-over-year declines in earnings. It's also worth mentioning that Sempra's utilities business is very seasonal because of its natural gas distribution assets, so don't read too much into the sequential decline in earnings. Data source: Sempra Energy earnings release. Chart by author. Sempra took those impairment charges this past quarter because those are two assets that management intends to sell, as part of the restructuring plan it put forth at its investor-day presentation back in June. The plan, as it currently stands, is to sell its entire portfolio of wind and solar assets, and all natural gas storage assets not associated with its California natural gas utilities. The company plans to focus on the transmission and distribution aspect of the utility business, develop its three liquefied natural gas terminals, and let its non-U.S. businesses self-fund their development plans, instead of allocating additional capital there. In late June, we communicated our strategic vision. It's focused on high-grading our portfolio with transmission and distribution investments and long-term contracted assets in tier 1 markets, all with a focus of becoming America's premier energy infrastructure company. In conjunction with this effort, we announced the planned sales of our U.S. wind, U.S. solar, and certain U.S. midstream assets. To meet Sempra's goal of becoming an energy infrastructure company, Martin also highlighted the most pressing issues management intends to solve besides its asset sale program. I want to emphasize that execution of our strategic plan to create long-term shareholder value remains top of mind. In the near term, our management team is focused on the following items: resolving our general rate cases; executing the sale of our U.S. wind, U.S. solar, and certain U.S. midstream assets; progressing the construction of Cameron [a liquefaction project in Louisiana]; and advancing our California wildfire risk mitigation strategy. The initial market reaction to Elliott and Bluescape's public plea for Sempra's management to shake things up was positive. So far, though, the plan that management put forward hasn't exactly received the response it was hoping for. The activist investors were looking for a reset of the board of directors -- of course they were, activists always want board seats -- as well as a much more comprehensive asset sale or corporate spin-off plan than the one management had put forth. Perhaps Sempra has further plans to divest other businesses, or to find other ways to juice per-share returns for the company. Until we see them, though, it's fair to say that this activist-investors' battle with management will go on for some time. The rest of us should probably stay on the sidelines to see who wins the fight.